I bought Colum McCann’s book, ‘Letters to a Young Writer’, after watching a spot on PBS Newshour hosted by Jeffrey Brown. Am I a young writer? Depends. 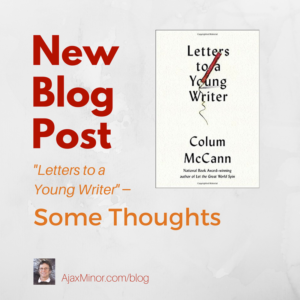 McCann says at one point ‘who cares how old you are?’, and that his ‘Letter’ could be to any writer. I must agree. I began to write fiction in my forties and recently published the first two books in a three book series, ‘The Ur Legend’. I’m on Medicare so this book must certainly have been for me as well as twenty-somethings. I’d like to offer up a few comments on the themes covered. First, though, let me say that there were a few times when the book made me smile. Or chuckle. Specifically, when it mentioned the word ‘advance’, as in money, and then asserted that ‘finding an agent isn’t all that difficult’. C’mon! The fact is I’m an Indie author and the rules of engagement are different for us than for those with MFAs. But Colum should know that since he declined pursuing an MFA himself. His main audience was a select club. I myself submitted a few short stories to literary magazines, fantasy of course, and was rejected. I had read many of the published submissions. Some were better than mine but some were worse. Then I checked the CVs of the authors and found them all to be graduates of writing programs. Talk about a glass, or paper, ceiling! That being said, there was much of value in McCann’s book for writers of all ages and all levels of experience. Now I’d like to comment on a couple of metathemes and then toss out a few fun one-offs from my reading of his essays. The first topic of importance is structure, which leads to the issue of ‘writer’s block’. I’ve never experienced it. Why, because contrary to one assertion in the book, I always know where I am going and it’s not ‘okay’ if I don’t. Before I sit down to write a short story or a section of a novel (or the entire novel for that matter), I have major signposts laid out in my head. Beginning, middle and end for a story or book, starting and endpoint of the plot for the day when I ‘put my arse in a chair’, as Colum so eloquently phrases it. I begin the day where I left off the day before and I know where I’m headed. The trick is that I never know exactly how I’m going to get from Point A to Point B. I just WRITE. If some of it is garbage it will come out on the edit (which I enjoy as much as the creative process). The babble will be deleted, or, if it happens to be decent prose or an intriguing idea, placed in my ‘sandbox’ file. Later in the book he says that once in a while you have no idea where you are going. Bravo! That’s where ‘block’ comes in. It’s ‘plot block’. Often I will hit a signpost and then realize it’s pointing in the wrong direction. Often I set the manuscript down for a month or more while I consider what new direction the story ought to take. Once decided, out comes the fountain pen again and down go the words (and the ‘arse’). The other major idea I’d like to talk about is the question of plot versus character. I like to think that it is character development that drives a story. That is what McCann calls the ‘human music’ of connection. In Joseph Campbell’s words, ‘the harmonious rhythm of relationships’, make a story work. On that issue, McCann claims that plot is subservient to language. I found this puzzling, then it occurred to me that he might have a point. Imagine?! My favorite work in all literature is the Iliad. While I read Latin, I never took Greek so I’ve had to rely on translations. I’ve read most of them and Lattimore’s is my favorite. How can you top ‘rose fingered Dawn’? And Pope’s is brilliant, even though I prefer Lattimore’s ‘grey eyed’ Athena to Pope’s ‘blue’. But to the point. There really isn’t all that much of a story in the Iliad; but the language, the human connection, the gore!, and the fickle quality of courage transfix. So maybe McCann has a point that most might not consider. Don’t worry about ‘wordcount’ but rather ‘wordcut’. YES! The first draft of my first book went from 222k words to 160k words working with Jeanne Cavelos, a wonderful editor, ‘book doctor’ and writer. Then we plunged form 160k to 99k with the help of John Barnes. Same great credentials as Jeanne. A good Book Doc is invaluable. They don’t do the cutting for you, they just suggest. ‘Novelists should read poets, poets should etc.’ I always keep a copy of Sylvia Plath’s ‘Ariel’ close at hand. The goal is to be poetic, to the extent it is practical, with prose. Poets express themselves in ways that make no sense when deconstructed but beyond perfect sense when done well. Plath: ‘the baby’s cries rose like bright balloons.’ Some prose writers are quite good at it. Barbara Kingsolver for one. Surprisingly, I think John Cheever did it best. Read his short stories. ALL of them. ‘One little word for dialect’. YES. I’ve created a couple of characters from Brooklyn (where I used to live, BTW). It took me a while to realize that ‘Ay’ and ‘Fugeddaboutit’ were sufficient to place the accent in the reader’s imagination. On criticism: Always take criticism as constructive to improve your writing. And always remember that art is entertainment; which means that one thing you will never be able to do is to argue your audience into liking your work. That’s about it for now. 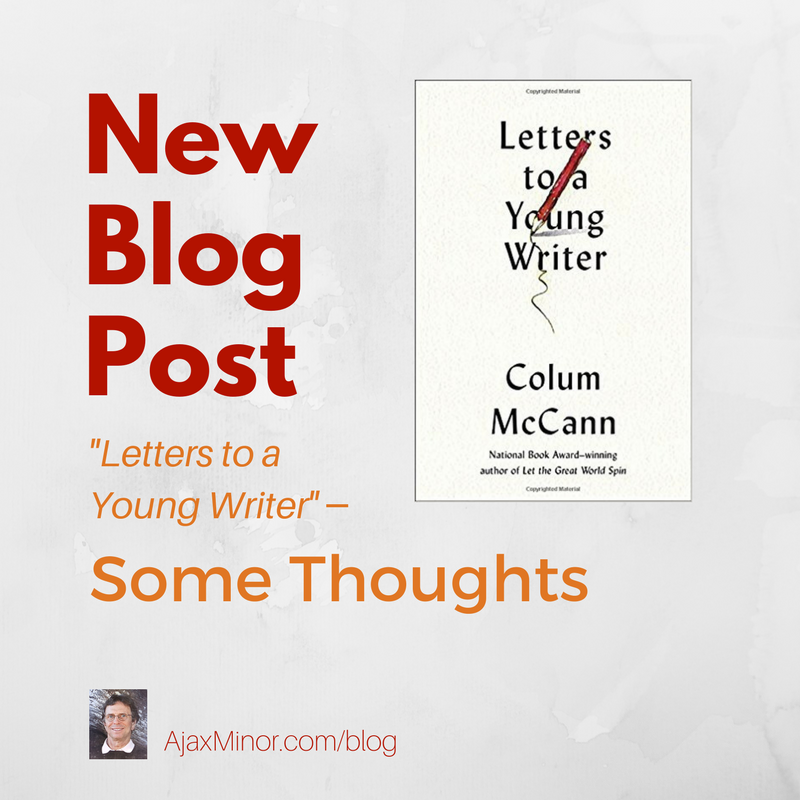 Get Colum McCann’s book, ‘Letters to a Young Writer’. Also, this post is quite interesting. Yet I have to say that Bukowski and his work is testimony for a proviso to the “never drink while writing” bit.